Inspired by Mike’s bún gà nướng sả and, as always, by his trip to Vietnam, I decided one night to try my hand at a vegetarian version using ingredients I already had at home. I was fortunate to have some of Mike’s Vietnamese basil, grown from seeds he brought back home, and some rice vermicelli from my last shopping trip in Chinatown. Instead of his lemongrass chicken I used tofu and, although it may not be traditional, I added an avocado for meaty richness. 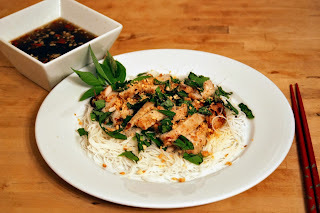 I absolutely love these Vietnamese rice noodle dishes. The noodles and vegetables are served at room temperature, keeping the dish light, refreshing, and easy to prepare. The protein should be warm to take advantage of the contrast between hot and cold, sort of like a good brownie sundae, although for the one pictured here I didn’t bother. You’ll need some nước chấm dipping sauce, which can be made in a few minutes and stored in the fridge. If you can’t find Thai or Vietnamese basil, use mint instead. 1. Bring a pot of water to boil and cook the rice noodles according to the package instructions. Rinse them under cold water to stop the cooking and set aside. 2. Meanwhile, prepare the other ingredients. 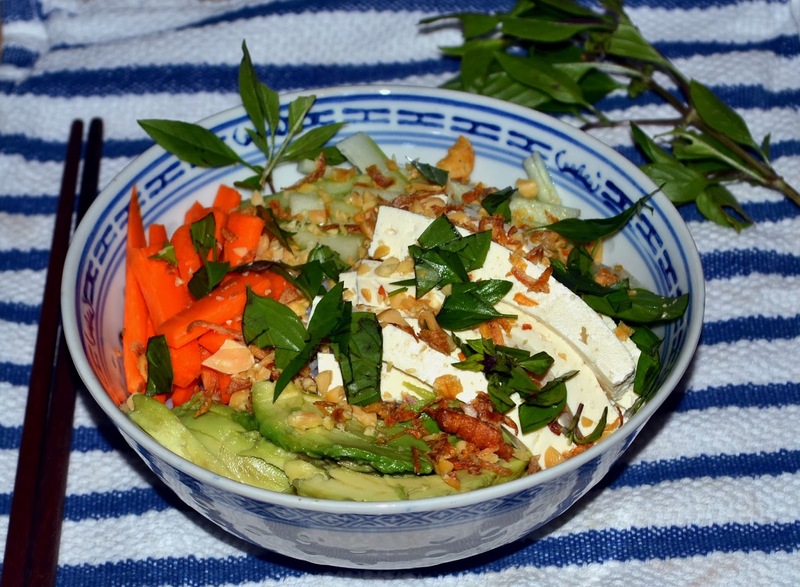 Make the nước chấm if you do not already have some saved. Drain the tofu, dry it thoroughly with paper towels, and cut it into cubes or strips. Julienne the carrot and cucumber. Peel and slice the avocado. Finely chop the peanuts. 3. When the noodles are done and rinsed, portion them out into bowls. 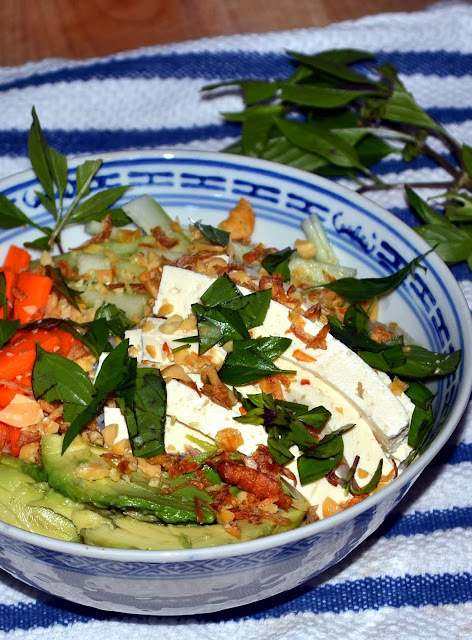 Place the carrot, cucumber, and avocado over the noodles, each in its own quarter of the bowl. 4. Heat a nonstick pan over medium heat. When it is hot, add the canola oil. Add the tofu to the pan in a single layer so that it gets a nice sear. Turn the tofu a few times to give it a good sear on each side. 5. When the tofu is done, place it in the remaining quadrant of the bowl. Top the whole dish with the chopped peanuts and crispy onions. Tear some basil and sprinkle it on top. Serve with nước chấm on the side. This looks delicious. I've been wanting to make a bun for a while. This will have to me my next recipe! Thanks! These are so refreshing. You'll love it.